HARMAR TWP., Pa. — Hockey season is officially in full swing now that October is here. As the weather starts to cool down, Pittsburgh’s hockey clubs are heating up. The Pitt men’s team opened its home slate for the 2018-19 season against No. 18 Kent State on Friday and Saturday at Alpha Ice Complex. The Pitt women faced College Hockey East conference foe California University of Pennsylvania, where the Panthers looked for their first win of the season to stop their four-game losing streak. Duquesne continued conference play in the CHMA against Robert Morris. 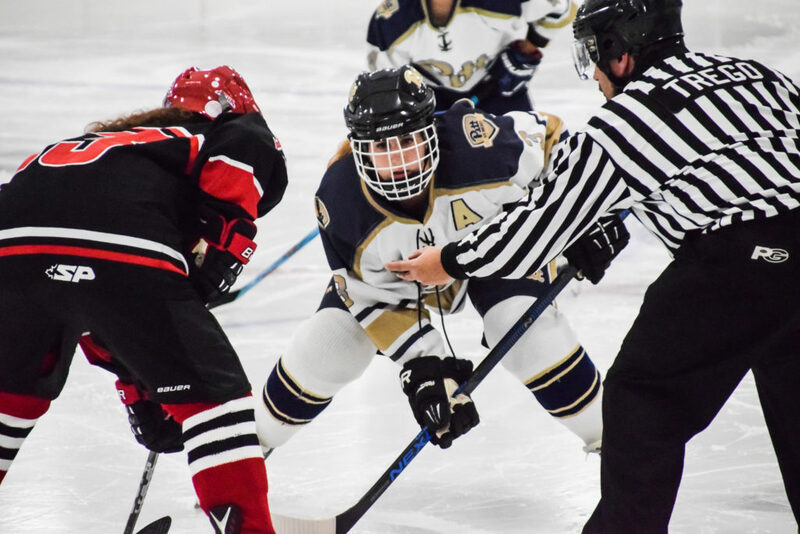 The Pitt women opened the exciting ACHA weekend and entered their game against CalU on Friday night having lost four straight to open the season. The Panthers gave up six goals in two of those four games, once to Penn State and once to Buffalo. During the second game in each of those series, the Panthers were able to keep the game close. With only a single game during the weekend against CalU, the Panthers had to start fast and stay ahead if they wanted to earn their first victory of the season, and they did just that, routing the Vulcans, 10-2 to get into the win column. Forward Katya Hernandez scored just over a minute into the game to give the Panthers the fast start they needed. Five minutes later, Shannon McCafferty scored to put the Panthers up 2-0. Tarika Embar and captain Breanna Doherty scored 19 seconds apart at the end of the first period to give first-year goaltender Kathryn Rerko, who saved 16 of 18 shots on the night, a four-goal cushion. In the second period, Jackie Sharp and Kristine Earl put two more up before Cal U broke the shutout with a goal by Julia Odell. Earl scored again for the Panthers just 30 seconds into the third and then assisted on Natalie Foster’s goal two minutes later to put the Panthers up 8-1 and put the game out of reach for the Vulcans. Odell added her second of the game to attempt to rally for the shorthanded Vulcans, who played with a four-player bench, but a goal by Rosemarijn Saleh and Earl’s third of the game secured the 10-2 win for the Panthers. The Pitt men’s team opened their home season at Alpha Ice Complex against another nationally ranked opponent on Friday and Saturday. The Panthers, who received votes in the preseason rankings and the first regular season rankings, traveled to No. 22 Alabama the previous weekend and came away with a split of those two games. For this series, Pitt hosted No. 18 Kent State. The Golden Flashes had swept Robert Morris in a home-and-home series the previous weekend. On Friday evening, it looked as though the two teams were evenly matched before Pitt pulled away for a 3-2 win. In the second period, Pitt forward Milo Defay scored just 25 seconds in to open the scoring on an assist by Trent Thomas. Thomas scored his own goal less than a minute and a half later and then added another just over the halfway point of the period. Kent State got on the board late with a goal by Ian Herrmann with 18 seconds left in the frame. The lone goal of the third period was by Sean Moore to bring the Golden Flashes within one, but the Panthers held on for the victory in front of goaltender Matt Snader. Through two starts, Snader has saved 108 of 111 shots for a 0.973 save percentage and a 1.50 goals against average. On Saturday, the Flashes fought back for a 4-1 win. Pitt started goaltender Garet Ciaramella, who also started the second game at Alabama the previous weekend. Unfortunately, Ciaramella has been less than stellar in his two starts. After giving up six goals to the Crimson Tide, he fell into a 2-0 hole early in the second period against Kent State. Milo Defay scored the Panthers’ lone goal of the game early in the second, but Ciaramella gave up two more to the Golden Flashes in the third period. Through two starts, Ciaramella has saved 86 of 96 shots for a 0.896 save percentage and a 5.00 goals against average. The bright spot is that forward Defay has five goals through the first four games, while Thomas has two goals and two assists. While the offensive power is there, the lack of consistent goaltending has been an issue for the Panthers so far this season. Duquesne went into their conference tilt against the Colonials having lost three straight games. The Dukes split their series against Towson two weeks prior and lost both games to Oakland (Mich.) one week later. The history between the Dukes and Colonials, however, meant that it was anyone’s game on Saturday night. Robert Morris defeated Duquesne in the first game last season 9-6, taking advantage of the absence of injured goaltender Alex Taylor. The last time the two teams met, in January, the Dukes lost 6-5 in overtime after tying the game with seven seconds to go. The Dukes turned those losses into all the fuel they needed to light their offensive fire in an 8-3 victory on Saturday. Rookie Johnny Percoskie opened the scoring four and a half minutes in with assists by defenseman Daniel Bigley and forward Martin Hubert. After the Colonials answered with a goal of their own 19 seconds later, Duquesne sophomore Stephen D’Elia took a feed from junior forward Sean Lloyd and beat RMU goaltender Lewis Richardson glove side to break the tie. Percoskie added his second of the game to give the Dukes a 3-1 lead after the first period. The Colonials tightened up in the second, cutting the lead to 3-2 on a goal by Andrew Hachmeister. Senior forward Ryan Sweeney added to Duquesne’s lead a minute and a half into the third period and Lloyd and sophomore Chris Nathan scored two minutes apart later in the period to give goaltender Alex Taylor a four-goal lead. Nathan’s goal was the straw that broke the camel’s back and Robert Morris goaltender Lewis Richardson was pulled in favor of Kevin Mackey. Unfortunately for Mackey, the Dukes were not finished. Two goals by sophomore PJ Breslow increased the lead to six goals before Hachmeister got his second of the game for the Colonials to play damage control. Duquesne (3-3, 2-0 CHMA) saw goals by six different players and saw 10 different players earn points in the 8-3 win over Robert Morris (0-2-2, 0-1-1 CHMA). The Colonials remain winless headed into a weekend series next Friday and Saturday at West Virginia (2-2-1, 0-0-1 CHMA) and home against IUP (1-4-1, 0-0-0 CHMA), respectively. The Dukes will visit IUP on Friday and host West Virginia Saturday.